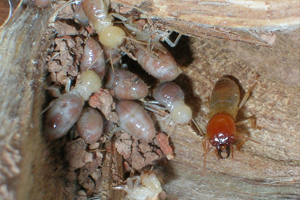 Termites are eusocial insects that are classified at the taxonomic rank of infraorder Isoptera, or as epifamily Termitoidae within the cockroach order Blattodea. 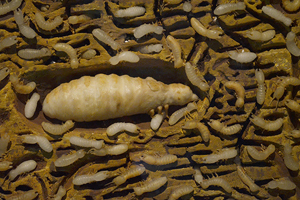 Termites were once classified in a separate order from cockroaches, but recent phylogenetic studies indicate that they evolved from close ancestors of cockroaches during the Jurassic or Triassic. 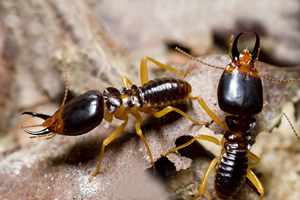 However, the first termites possibly emerged during the Permian or even the Carboniferous. About 3,106 species are currently described, with a few hundred more left to be described. Although these insects are often called white ants, they are not ants. Forage for food and care for other members of the colony. It is the workers, along with newly-hatched nymphs that do the damage to the structure. There is only one primary queen, but when she dies, secondary queens are often produced. 2- Keep pest population within a level below nuisance and economic leve.This standard gives recommendation for the chemical treatment of soils for the protection of buildings from attack by subterranean termites. It includes reference to the chemical to be used, lay down the rate of application for usage, and outlines procedures to be followed while the building is under construction. this is a process in which soil treatment is applied to a building during the early stages of its construction to form a chemical barrier. 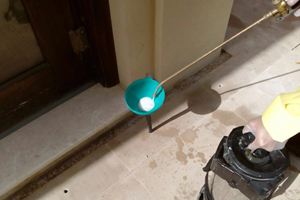 Treatment of junction of wall and floor: chemical emulsion will be sprayed at the rate of 1 liters per linear meter at the junction of wall/floor. 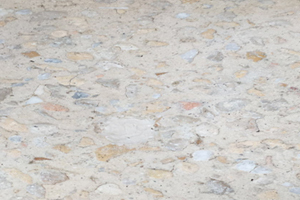 The horizontal surfaces where water table is high, the treatment shall be applied on top of the lean concrete to have a chemical barrier which will not be in contact with the existing high water table. Through water table termites cannot infiltrate into the surface but the chemical barrier is recommended, the water table might go down and in such case, this chemical barrier will prevent all termites seeking entry to the building. Refill soil treatment (back filled) to the external walls of basement or excavation of footing up to ground level. 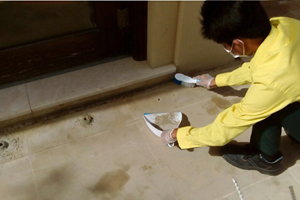 To proceed with vertical barrier treatment, the chemical dilution has to contain 0.03% active ingredient and shall be applied at rate of 1 liters per 100 cm depth in a strip of 30 cm width. Condition of formation - barrier shall be completed and continuous under the whole of the structure to be protected all foundation shall be fully surrounded by and in close contact with the barrier of treated soil, each part of the area treated shall receive the prescribed dosage of the termiticide. Time of application - soil treatment should start when foundation trenches and pits are ready to take mass concrete in the foundation. Laying of mass concrete should start when the chemical emulsion has been absorbed by the soil and the surface quite dry. Disturbance - once formed treated soil barrier shall not be disturbed, if by chance treated soil barriers are disturbed immediate steps shall be taken to restore the continuity and completeness of the barrier system. SWARMS that occur within a building are positive evidence that the structure is infested. SWARMERS are attracted to light and are often seen in large numbers around windows. caused by other wood infesting insects because they usually contain soil particles instead of sawdust. MUD TUBES are also evidence of an infestation. When termites cross concrete and similar materials to reach wood, they construct these tubes as a shelter. The tubes are made of soil particles cemented together with saliva and excreted fluid waste. SOIL PASSAGES. 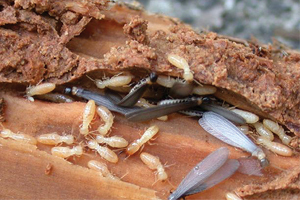 Termites feed on wood and cellulose materials, but they also need constant moisture to survive. Colonies usually nest in the soil which provides that moisture. MOIST WOOD and wood which is in direct contact with the soil such as under a dirtfilled porch, provide ideal conditions for termites. Drilling 20 mm diameter holes at 30 cm intervals to reach the soil below the slab at the point where there is evidance of termite infestation, then all the holes to be injected with 1-2 liters of termiticide solution and then to be sealed with concret and the top of the hole where the tile is to be sealed with mixture of the tile powder and glue. A) Door frame at the contact with floor tiles. B) at the junction of the floor and walls as results of shrinkage of the concrete. 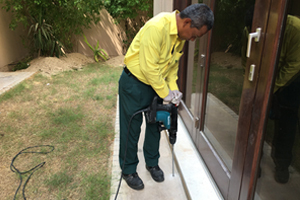 Drilling 30 mm diameter holes at 30 cm intervals to reach the soil below the slab / interlock tiles with depth of 60 cm to reach the foundation below, then 2-3 liters of termiticide solution to be injected in each hole, then to be sealed accordingly. Trench to done at sandy perimeter with depth of 60 cm and width of 30cm then the trench to be treated with termicide solution at rate of 5-7 liters per runing meter, then the backfill soil to be treated with the same solution when itis applied back.